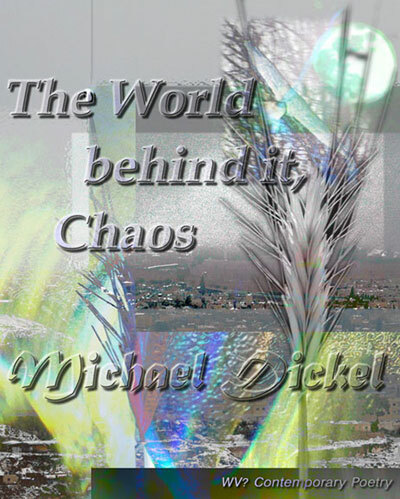 A collection of poetry, photography and digital artwork by Michael Dickel. Michael Dickel's poetry has appeared in small-press literary magazines for over twenty years. His photography and artwork has been published in art books, literary / arts journals, and online journals for around five years. Most recently, two of his poems received recognition through the international Reuben Rose Poetry Competition. This collection brings together the best of his poetry with visual art that both complements and complicates the reading. Artistically laid out, The World behind it, Chaos� provides both visual and intellectual provocations towards sensing both the wonders of our world and the chaos that lies just beneath our lives. Beginning with a sharp intake of breath ("Leaping Deer") and ending with the crumbling of the present into sand ("Return of the Sea"), the poetry arcs through life, politics, nature, mysticism, and human relationships. The images spark from that arc, creating moments of reflection to absorb the words, or creating their own visual poem to enhance the "text" of the book. "Michael Dickel, in The World behind it, Chaos�, reveals life's chaos in all the dark, hidden places, as well as often unacknowledged order that stares us right in the face: the pastoral beauty of nature; the alarming and sometimes ugly; the knowing; the quiet yearnings of the human soul; memory, nostalgia, love; the stagnation or inability of humanity to see clearly or grow." The poems themselves range from the quiet lyric to experimental prose poems to surrealistic-imagistic explorations. One long poem near the center of the book ("The Morning News") collapses time while chanting TV news, interspersing quotidian activity, joining events across decades, all the time swimming in the chaotic insanity of megalomania in cult and government leaders. We emerge, as readers, on the other side into a theoretical world of materiality and ideas ("Materiality," "electronic transfer," and "language you/me") that merges into a spiritual and sensual world (as in "Theosophical Summer Evening, 1972") that eventually encounters a pragmatic world of clipping coupons and raising children ("Still Kalamazoo, Mother's Day at the Airport"). Yet, this pragmatic world still contains wonderment and chaos side by side, even as the voice of the poet grounds itself in nature ("Renewal"). In the end, the seas overtake even the Midwest ordinariness of life, a city collapses into ruin, and we are reminded that history moves on, "�the foundation collapses, pieces of brick grind into sand" ("Return of the Sea"). Yet, somehow, it is not a pessimistic message. Overall, the poems and images suggest the place of the individual, the importance of choosing a direction (any direction) even in the face of collapse, and the mystery of life as revelation: "�all simmering, composting toward a distilled memory / to sip against the coming chill" ("After the Frost"). "I love the way Michael Dickel's poetry mixes eros and kabbalah with politics�beautiful, disturbing, soaring." �Adeena Karasick, poet, cultural theorist and performance artist, and the award-winning author of six books of poetry and poetic theory, most recently The House That Hijack Built (Talon Books 2004).